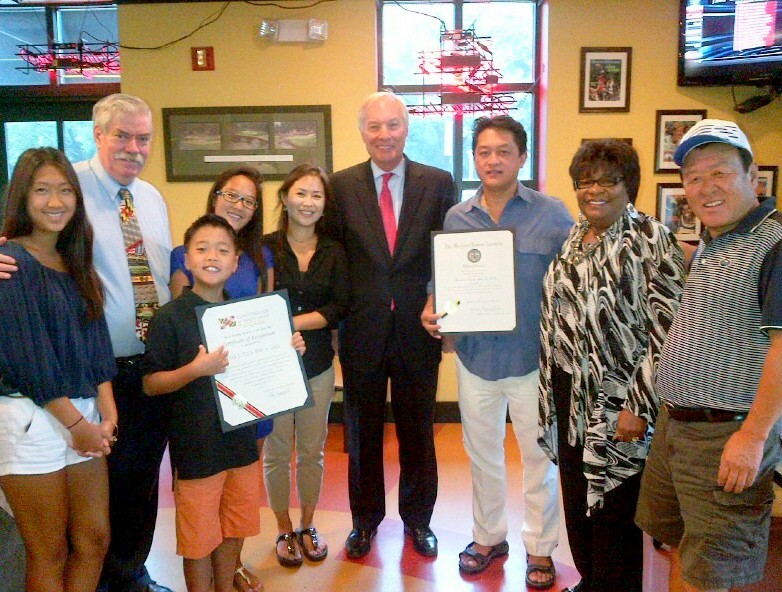 Above: Joyce and Chil Chong with Councilman Robert Curran, state Comptroller Peter Franchot and Del. Barbara Robinson as their establishment, Maxie’s Pizza, receives a proclamation from the Comptroller’s Office. 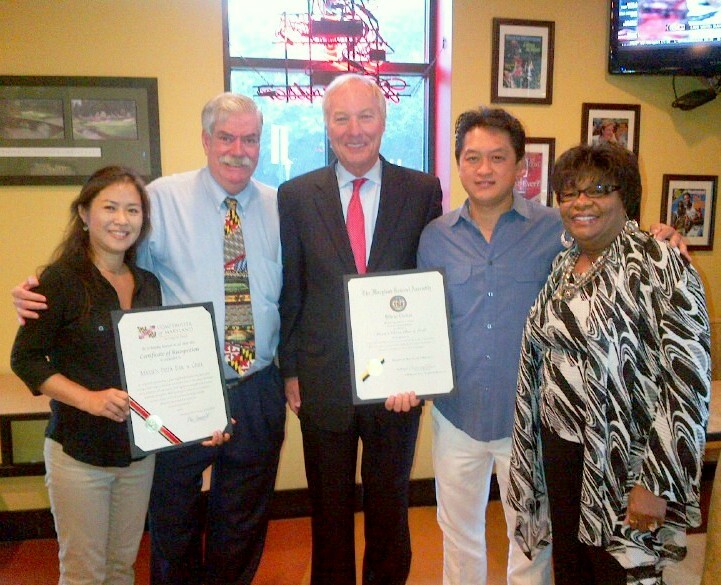 Councilman Robert W. Curran is listed as a co-licensee on the Maxie’s Pizzeria & Grille liquor license, along with Joyce Yun Chong of Pikesville. Records show that Curran, who represents Northeast’s 3rd District, has been on the license for more than a year. And he was one of three city residents vouching for the owners on their January 2012 license transfer application. Asked if he is an owner of the business, Curran told The Brew that he knows the owners personally and became a licensee as a favor to them. He said, “I have no financial interest” in the establishment, which is located at Charles and 31st streets. But in a further twist in an already convoluted story, Curran said that he worked at the bar on Friday and Saturday nights for several months this year “on a volunteer basis,” checking customers at the door and helping to screen for under-aged drinkers. Curran said he stopped performing these unpaid screening duties before the pending violations at the bar, which allegedly took place in October and last month. Hoping to untangle this unusual tale, The Brew asked Joyce Chong’s husband, co-owner Chil Song Chong, if he would explain Curran’s role at Maxie’s. By the time we reached the establishment yesterday, Chong said his lawyer had advised him not to speak. Asked who is his lawyer, Chong named attorney Frank Boozer, adding, “His father is Senator Boozer,” referring to former Baltimore County state Sen. F. Vernon Boozer. Records on file with the Liquor Board show that Curran’s relationship with the establishment goes back to January 2012 when he vouched for Joyce Yun Chong and her husband, Chil Song Chong, the two initial licensees, on their transfer application. In May 2013, Curran’s status changed. In renewal paperwork, Curran and Joyce Chong are listed as the co-licensees. The file indicates that Curran was asked to submit all of the standard criminal background check information required of licensees, including being fingerprinted. The violation scheduled to be heard Thursday involves a bar employee’s alleged attempt to hide the evidence of under-age drinking when the police came to investigate on October 24. The employee “began to tell suspected underage bar patrons to ‘hide in the restrooms’ in order to avoid contact with Officers,” according to the board’s docket sheet. The violation is for non-cooperation, although the police report described an 18-year-old found to be drinking a beer in the bar who did not appear to have used a fake id to get it. After asking the Liquor Board about the case yesterday, The Brew learned that the hearing has now been postponed until January 8 or later, amid additional violations coming. 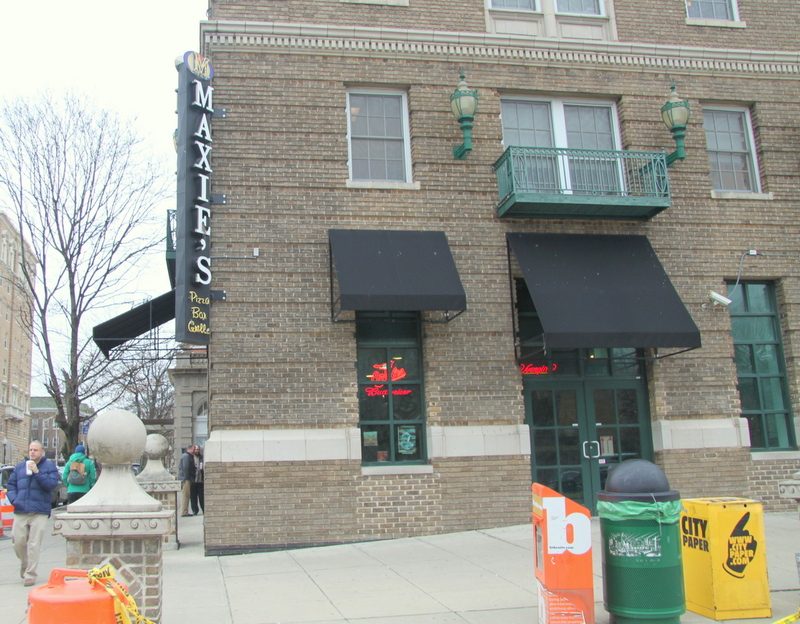 Reports of underage drinking and overcrowding at Maxie’s from liquor inspectors, the city fire marshal and the police department go back to early 2012, according to Liquor Board records. One case also mention the presence of Johns Hopkins University security officers. The establishment is located near the Hopkins Homewood campus, in a building owned by the university and managed by the Cordish Company. There is an upstairs carryout with counter service and inside and outdoor tables as well as a sub-basement bar. Fire Inspector Herbert R. Gross said in his report that it involved 200 people clustered inside and outside the establishment. “We are just glad that no one got hurt,” Fogleman said. In the police report on the incident, in which the officer was responding to a reported assault, an 18-year-old was found with a Natty Boh in his hand and five other under-aged patrons who smelled of alcohol were found coming out of the bar. The Liquor Board inspector cited Maxie’s for multiple instances of selling to minors, as well as overcrowding. “Mr. Chong, your lawyer will tell you we’ve reached the end of the road as far as underage activity, so if we see you again in an underage drinking situation you can expect a suspension from this board,” Fogleman scolded Chong, at the December 13, 2012 hearing. Maxie’s had been charged with multiple underage drinking violations, but was allowed to plead guilty to one of them and to one charge of overcrowding. They were fined $2,875 plus a fee of $125 for a total $3,000. Asked if Curran has an ownership interest in Maxie’s, Chong said, “No comment,” and walked away. The Chongs appear to be significant Democratic party contributors. In 2005, they gave Friends of Martin O’Malley $500. Last year, they gave Friends of Anthony Brown $4,000, the maximum amount for individuals. Asked to explain his relationship with Maxie’s, Curran said it was a simple matter of personal friendship. “I’ve known the family for 20 years-plus, been to holiday celebrations and everything,” he said. Curran said he was introduced to Chong’s father by Jai Ryu, then special assistant to Mayor Kurt Schmoke and a liaison to the Korean community. Asked why he took the further step of becoming not just a character witness for Maxie’s but a licensee, Curran said it was just another favor. He said Chil Chong’s father Max Chong asked him to be a “resident agent” on the license. As for the propriety of a City Council member being a liquor licensee, Curran correctly pointed out that the law does not prohibit it. As for his association with an establishment with multiple underage drinking violations, Curran defended Maxie’s as being unfairly blamed for problems not of its own making.